East Fish Camp provides shelter from WNW and NW wind and swell. 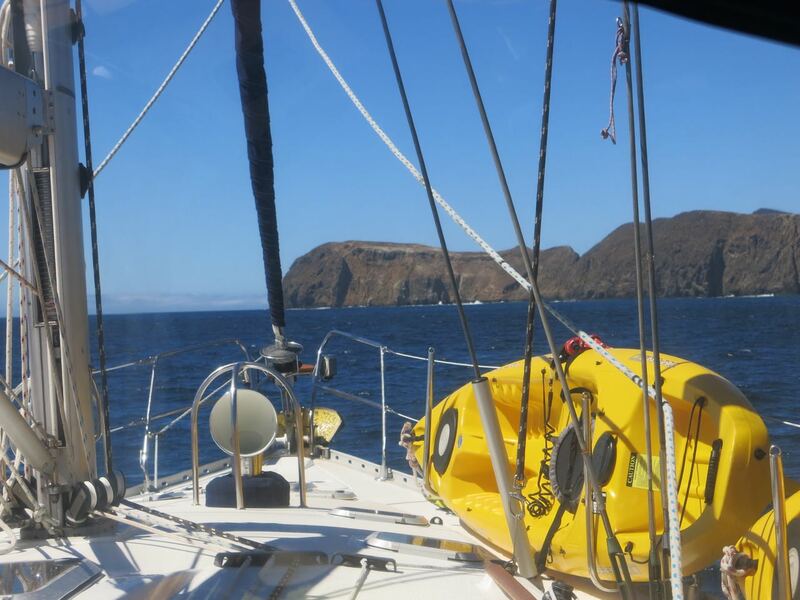 In calm conditions, yachts anchor 100 yards off the shore all along East and Middle Anacapa. That’s in VERY calm conditions. If it’s not glassy, we poke into East Fish Camp. We generally anchor in about 30′ between the drying areas (green). Stand-off from the shore at least quarter mile or more to avoid rocks that uncover near datum. We generally anchor east of the area that uncovers at low tide (see chart at the bottom). That puts us about one-third of the way from the N-S headland to E-W part of the island. 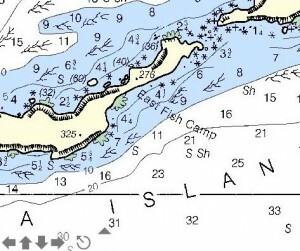 Take a tour of the anchorage and spot the rocks indicated on the chart and the two drying areas (green areas on the chart) before dropping your hook. The bottom is Sand and Shell and is a good holding ground. There is not much room to swing here and if you anchor in very close, setting a second anchor would be prudent. In any event, we always remain alert for wind shifts created by the headland and are always ready to bail out. Most locals don’t think it’s a good idea to overnight here. The first time I was tempted to do it, I found a 60+ foot yacht anchored on an all-chain rode just about where the ‘E’ in East Fish Camp is located on the chart. The wind had come up from the WSW rather suddenly and the 20+ foot inflatable he had tied astern was flying like a party balloon. And he was, as you’ve probably figured, on a lee shore. East end of Anacapa. Landing Cove, just to the right, East Fish Camp below the headland on the left. Our choice, then, was Smugglers/Yellow-banks, a hard slog to weather of three or four hours under sail or a broad reach of three hours back to Ventura (would have been 2 to Channel Islands). We chose to sleep at home that night and a had a spectacular 8 knot run with bioluminescence lighting our wake all the way home. On a calm morning 15 years later, we set out to give it another try. The video above tells the story. The caveat is pick a calm period and definitely avoid the place if the wind has any southerly component. 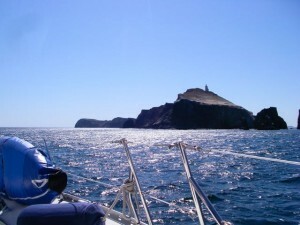 Visitors are allowed on Middle Anacapa (where East Fish Camp is) by permit only and when accompanied by a park ranger. If you have new or amplifying information concerning this anchorage or the surrounding area, please contact Capt. Dan. His e-mail link and phone are top left.